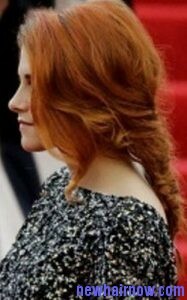 Kristen Stewart has got an inside out plait hairstyle that looks almost similar to the French braid. This hairstyle normally features a unique method of reversing that is used to make the French braid over your head. It is usually worn down at the back of your head near front hairline towards the nape of your neck. First take a rectangular panel of your hair on over the head that must run from your front hairline near the temples and move toward crown of your head. Divide this hair part into three segments by keeping the right strand in your right hand, middle and the left strands between your fingers in the left hand. Start crossing your strand in the right hand under the middle strand and take the original middle strand with the right hand. Try to take all the three hair strands to tighten the plait. Use the same technique to cross the left hand strand under the middle strand to make left strand as new middle strand and try to pull the plait tight. Take narrow hair section against your scalp from the right front hairline to center of your head. Add newly collected hair along with present right hand strand and take narrow section in the left side for adding it over left side with the existing left hand strand. Continue this till end of the hair and secure it using a hair band.